The holiday weekend was a very busy time for Norfork Lake. 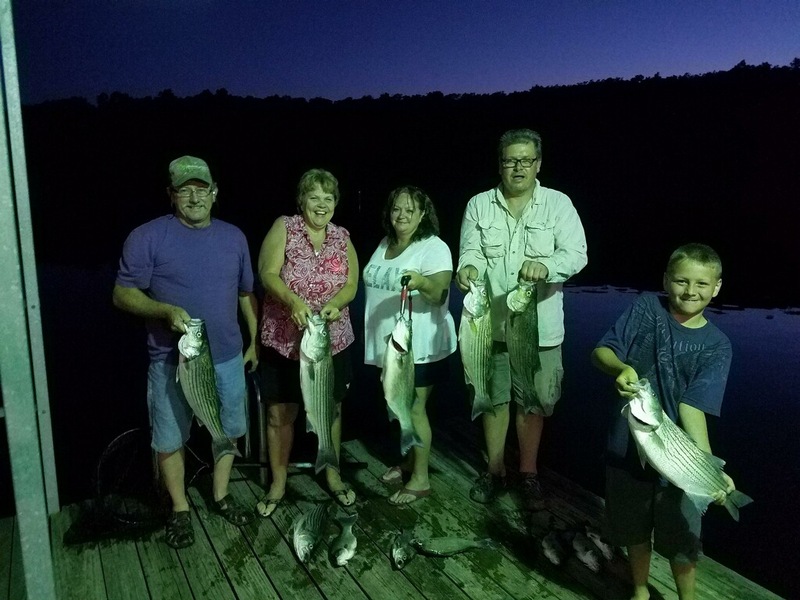 There were many fishermen and women out on the lake catching plenty of fish. Others were enjoying the great weather that we had by playing in the warm, clean and clear water of Norfork Lake. It appeared that all of our guests had a great time and no one wanted to leave. 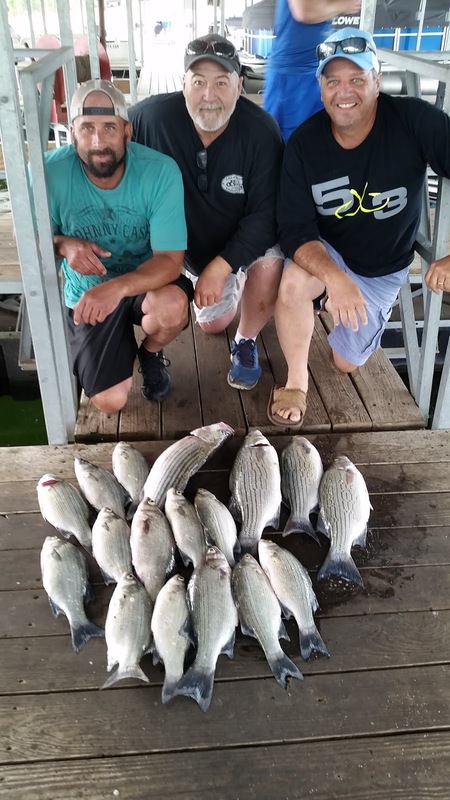 The striped bass, hybrid bass and white bass bite has been outstanding for the last couple of weeks. There has been plenty of topwater action for all of these species. The best time for topwater action starts at sunrise, lasts for a couple of hours and then happens again at sunset. You may need to move around to find the white water, but they are coming up all over the lake at various locations and depths. 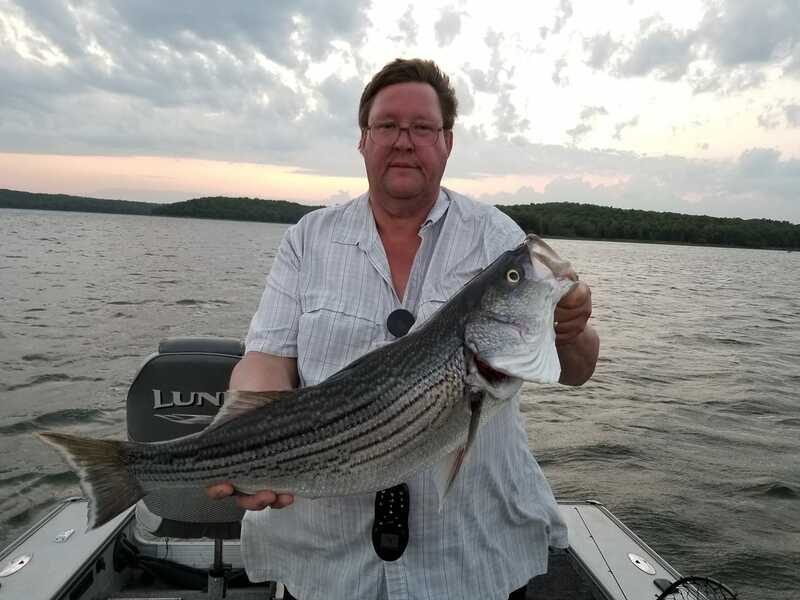 If you only see one fish come up and you are close enough, cast a topwater lure because there will be more in the area and they will come up for your bait. Today I fished in a major creek and had a fantastic time. 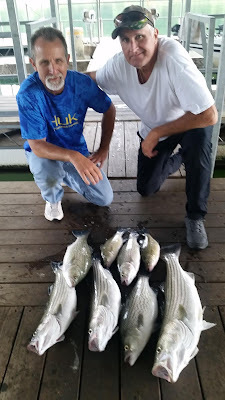 Landed 8 striper and hybrids using live thread fin shad. They were exploding on my free swimming baits and were also hitting baits that I had on with a 1/8 ounce split shot. I was moving slowly with my trolling motor about 1/2 mile an hour. 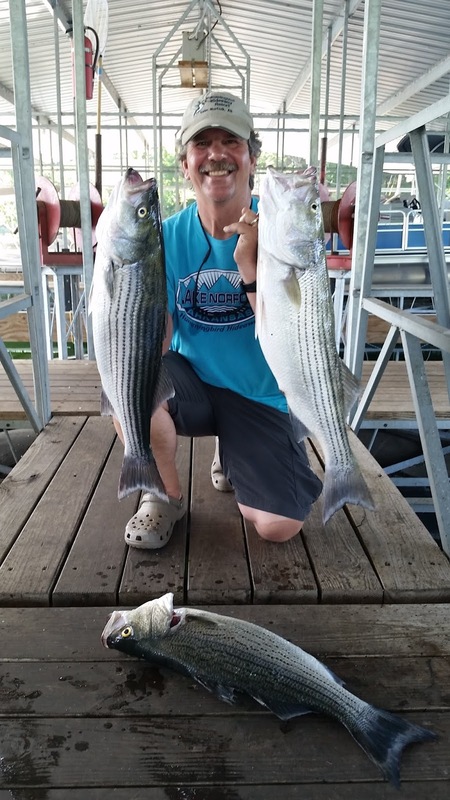 I started fishing along a shoreline in 30 feet of water and started to catch hybrids. 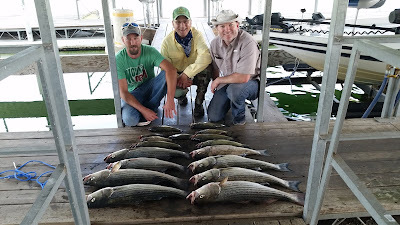 I then moved out to 60 feet of water and started to catch stripers. Swim baits and Alabama rigs are also working well to catch these fish. I am starting to mark big arcs suspended down 20 - 50 feet, so the stripers are starting to move down to the cooler water. 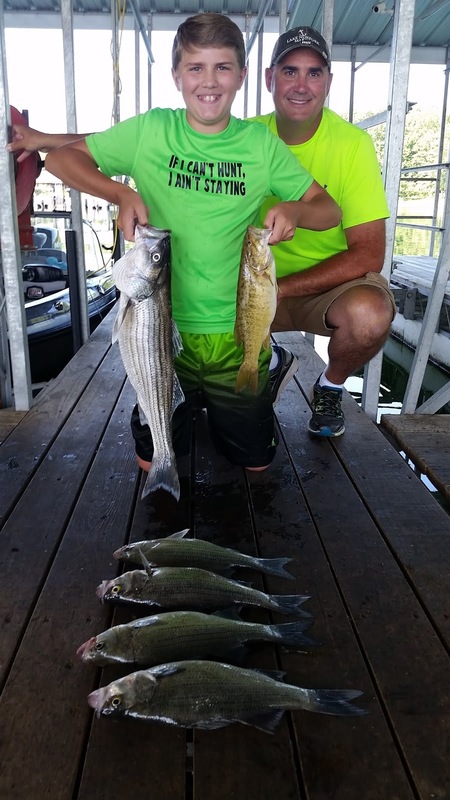 As the water continues to warm the topwater action for the stripers will stop and then restart in the fall when the water starts to cool. The fish that I cleaned today were full of crawdads telling me they are feeding close to shore at some point during the day. The moon is full so I would assume they are feeding heavily at night. 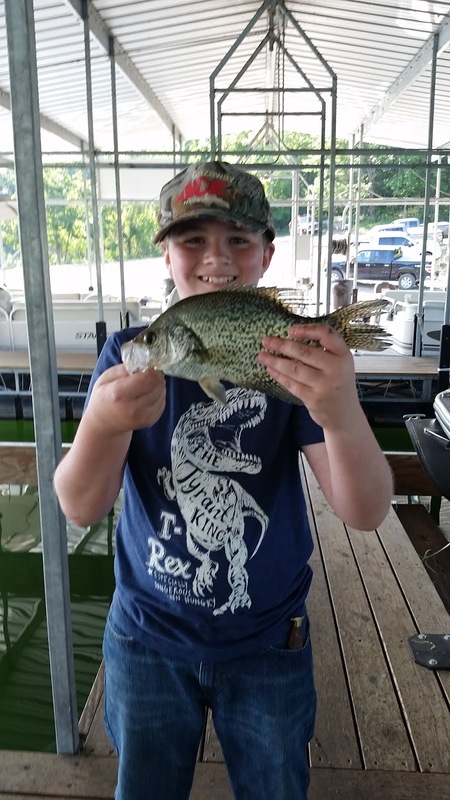 The large and smallmouth bass bite is still very good. Topwater baits, flukes and jerk baits are all catching nice fish. In the mornings work the shallow water that has sunken buck brush. As the sun gets higher move out to about 10 - 20 feet of water and work the bottom with your plastics. 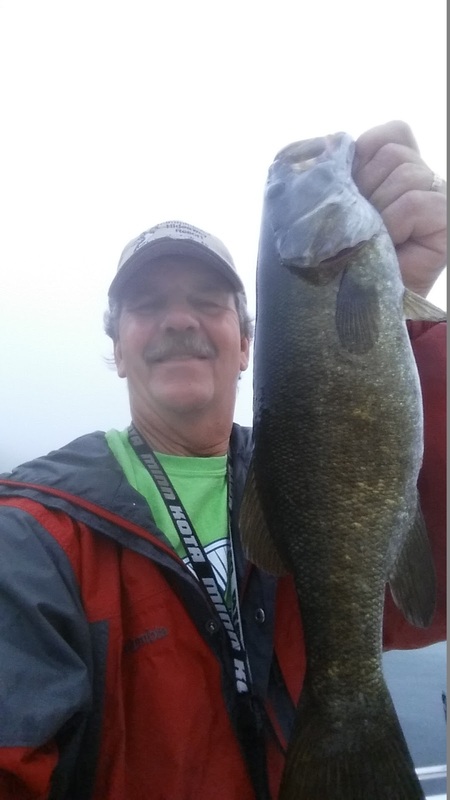 Bluff line points are holding some nice smallmouth bass. On occasion you will find the bass out in deep water feeding on the surface and topwater baits will work great. The walleye bite has also been good. They are being found inside of the sunken buck brush, as well as along deep bluff line where the channel is making a swing. Jerk baits, swim baits and casting spoons are all working. The crappie bite has been fantastic under docks in the middle of the day and also after dark. Small jigs and spoons are catching fish as well as small minnows. The fish appear to be from 15 feet down up to the surface.